Use the chart above for a guide to sizes for adult knitwear. This chart is useful as international sizes are not consistent. 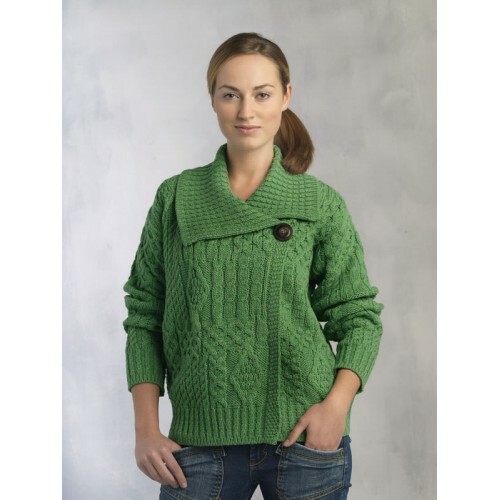 Remember that Achillknitwear.com operates a full no-quibble returns policy, so if you are not happy with the size of a garment purchased on Achillknitwear.com you can easily return it for an exchange or a full refund. Stylish knitted ladies cardigan in marl green colour, crafted in merino wool in shawl type design with collar button, available in sizes X-Small to X-Large.